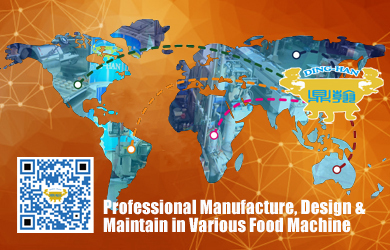 Ding-Han specialize in manufacturing food processing equipment. We design, engineer and build the machinery that creates and packages prepared meats, vegetables and seafood, french fries, baked and fried snacks, and other quality foods. We have a technician team with abundant experience and professional technique to provide food-producing solutions, whole plant and customization design, complete maintenance and after-sale service. All the machines are manufactured in our facility and all of the parts and components are made in Taiwan with high quality and good performance. We keep innovating and improving our quality to meet your need. Copyright © 2019 Ding-Han Machinery Co., Ltd. All Rights Reserved.